Thousands of paper on top quarks exist. Why? There are literally thousands of papers, collaboration notes, and conference notes with the words “Top” and “Quark” in the title. As of this post, there are 3,477 since 1979 listed on inSpires. There are many, many more that omit the word “quark”. And sure, this is meager compared to the 5,114 papers with the words “Higgs Boson” written since ’74, but that is over 50,000 pages of top quarks (estimating 15 pages/paper). To be fair, there are also many, many more that omit the word “boson”. But for further comparison, there are only 395 papers with a title including the words “Bottom Quark“, 211 with “Bottomonium“, and 125 with “Bottom Hadron“. So why are there so many papers written about the top quark? The answer is that the top quark is weird special. The top quark is very heavy, about 185 times heavier than the proton and ranks as the heaviest known elementary particle in all the particle kingdom. The second heaviest quark, the bottom quark, is only 4 or 5 times heavier than the proton. If you or I were a proton, then a medium-to-large school bus (without any people) would be a top quark. In fact, the top quark is so heavy it can decay into a real (on-shell) W boson, which is roughly half its mass. The only other particle that can do this is the Higgs. Though it is rare, exceedingly rare, the top quark can decay into real Z and Higgs bosons as well. Not even the Higgs can top that last feat. However, the top quark is still a quark. It has an electric charge that is 2/3 as large as the proton. It has an intrinsic angular momentum (spin) equal to the proton’s or electron’s spin. The top quark is also colored, meaning that is interacts with gluons and is influenced by the strong nuclear force (QCD). 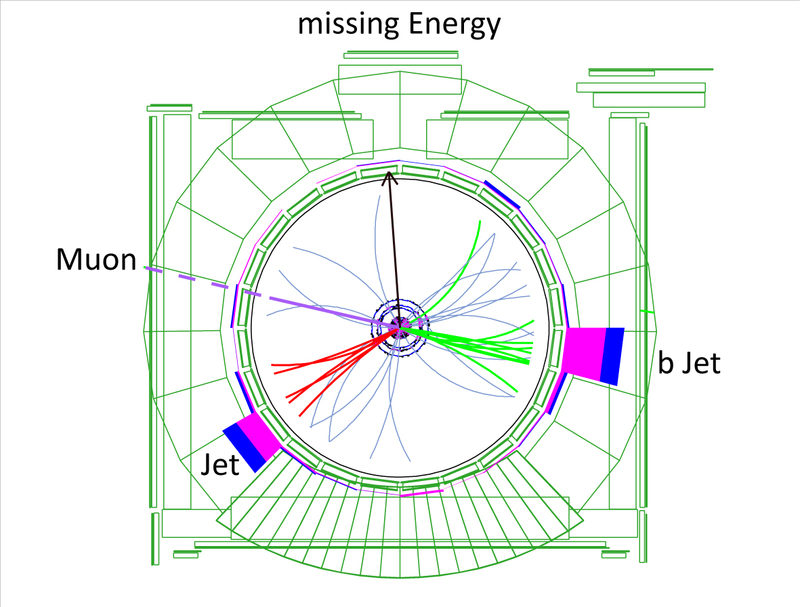 When colored objects (quarks and gluons) are produced at collider and fixed target experiments, they undergo a process called hadronization. Hadronization is when two colored objects are far away from one another and the strong nuclear attraction between the two becomes so strong that a pair of colored objects will spontaneously be produced in the space between them. These new colored particles will then form bound states with the old colored states. However, the process hadronization means that we only observe the bound states of colored objects and not the colored objects themselves. 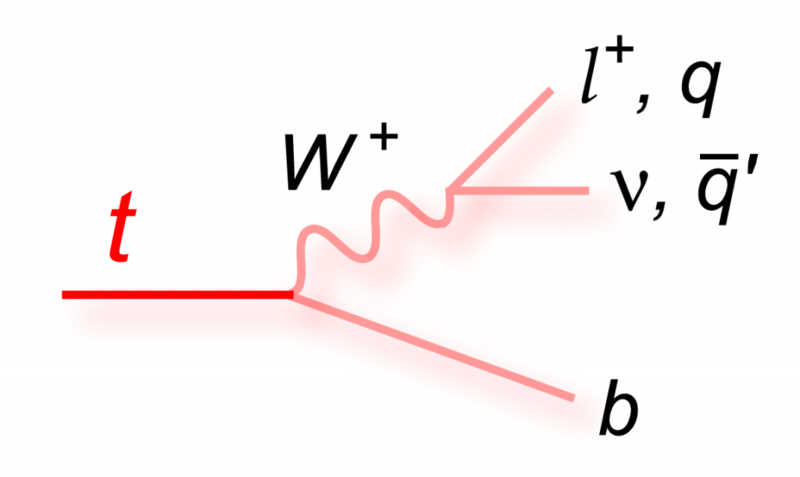 Physicists have to infer their properties from the physics of bound states…. or do we? Colored objects before (L), during (Center L and Center R), and after (R) hadronization. The onset of hadronization is typically occurs about 10-24 seconds after the creation of a colored object. Yes, that is 0.000000000000000000000001 seconds. That is incredibly fast and well beyond anything that can be done at an experiment. The mean lifetime of the top quark on the other hand is about 10-25 seconds. In other words, the top quark is much more likely to decay in to a W boson, its principle decay mode, than hadronize. 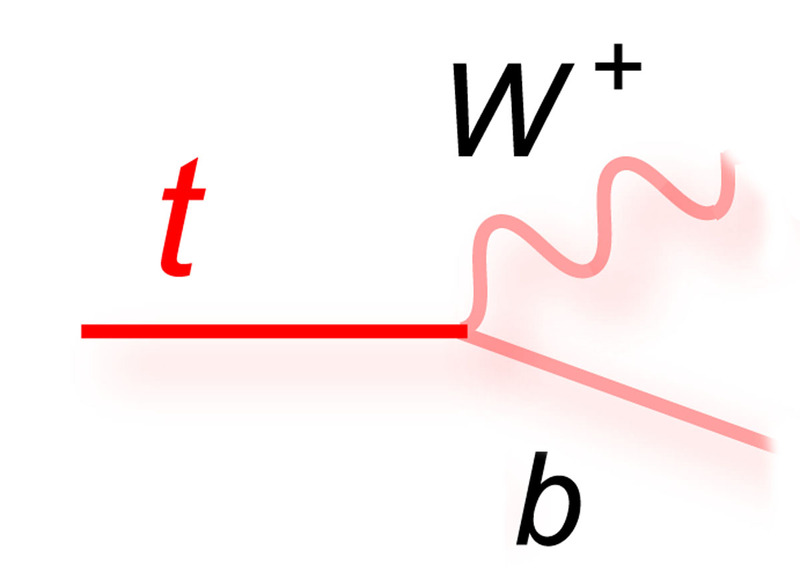 By looking at the decays of the W boson, for example to an electron and an electron-neutrino, their angular distributions, and other kinematic properties, we can measure directly the top quark’s quantum numbers. The top quark is special because it is the only quark whose spin and charge quantum numbers we can measure directly. The top quark tells us much about the Standard Model of particle physics, but it also may be a window to new physics. Presently, no one has any idea why the top quark is so much heavier than the bottom quark, or why both are orders of magnitude heavier than the electron and muon. This is called the “Mass Hierarchy Problem” of the Standard Model and stems from the fact that the quark and lepton masses in the theory are not predicted but are taken as input parameters. This does not mean that the Standard Model is “wrong”. On the contrary, the model works very, very well; it is simply incomplete. Of course there are new models and hypotheses that offer explanations, but none have been verified by data. However, thanks to the 2012 discovery of the Higgs boson, there is a new avenue that may shed light upon the mass hierarchy problem. We now know that quarks and leptons interact with the Higgs boson proportionally to their masses. Since the top quark is ~40 times more massive than the bottom quark, it will interact with Higgs boson 40 times more strongly. There is suspicion that since the Higgs boson is sensitive to the different quark and lepton masses, it may somehow play a role in how masses are assigned.